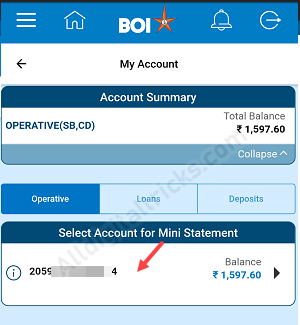 Now check your Bank of India (BOI) account mini statement on your phone. You can view the last 5 transactions details of your BOI account. Bank of India is one of the largest public sector bank in the country. You can open a regular saving account with just 2000 initial deposit. You will get all banking products like passbook, ATM card, cheque book, free net banking, and mobile banking facility. 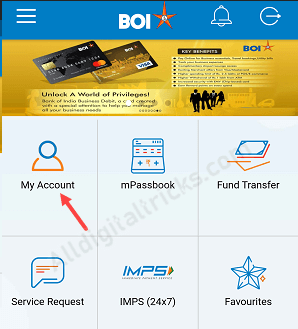 BOI mini statement enquiry facility available through mobile banking application which available for Android and iOS. You can install this application and complete the one-time activation process. You don’t need to visit Bank for passbook printing, just activate BOI mobile banking and check your account activity online on your phone. 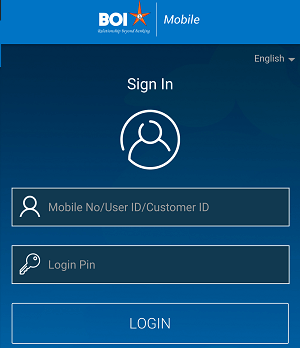 Step 1: Login to BOI mobile banking application, enter User ID and login password. Step 2: After login, tap on My Account tab. Step 3: Now tap on your account number for mini statement. And the next screen you can see your BOI account last 5 transactions history. You can also use Bank of India net baking facility and check account transactions activity. BOI customers can also register for email statement service and receive the monthly e-statement on email address. BOI account mini statement facility is really very helpful for those who unable to visit Bank to check account transactions activity. 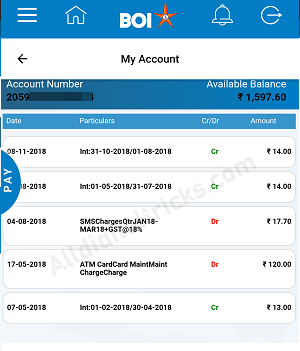 Install BOI mobile banking and check your account mini statement anytime.